I am so honored and excited to be part of the Atlantic City Food and Wine festival this year. I will be at the Grand Market July 26th, doing a demo and will also have a booth, signing cookbooks and sampling my gluten free peanut butter cookies. I hope you stop on by http://ac.gourmetshows.com/roberta-pipito/. This is such an amazing event. You don’t want to miss out on this summers biggest event. Caesars Entertainment Atlantic City is proud to present the Atlantic City Food and Wine Festival’s sixth annual celebration, beginning Friday, July 25, with events taking place throughout the weekend. The three-day culinary and spirits festival is the leading food and wine festival in the market and will feature a star-studded roster of some of the country’s most renowned culinary experts and TV personalities. 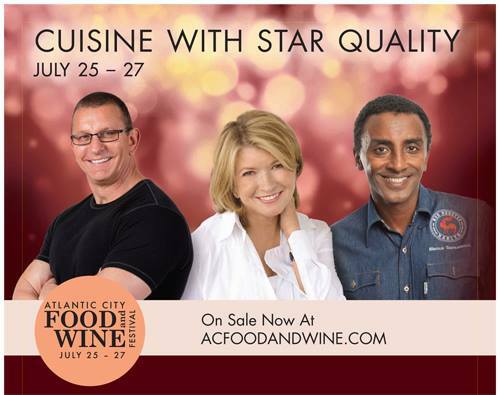 Headlining chefs include returning celebrity Chef Robert Irvine, a proven fan-favorite of festival guests;and the inaugural participation of James Beard award-winning chef and TV personality, Marcus Samuelsson, Co-Creator and Executive Chef of the acclaimed Red Rooster restaurant in New York City; more celebrity chef announcements will be made in the coming weeks. Additionally, in response to the success of The Barefoot Beach Soiree event last year, the majority of the weekend’s events will be hosted in beachfront and courtyard locations, allowing guests to celebrate this iconic festival outdoors and under the stars. One of the signature outdoor events of the year will be the “Burger Competition,” a first-time event for the Atlantic City Food & Wine Festival and one that has risen to popularity at many of the other popular food festivals in the country such as South Beach and New York. The Burger Beach Bash presented by “The Beef Checkoff” will be tented on the beach, replete with a Beer Garden and live music. The Barefoot Beach Soiree: It’s time to let loose and have some fun, when the sun goes down, the festival heats up. Enjoy an evening beachside party while savoring refreshing cocktails and gourmet passed appetizers. The Burger Beach Bash: Underneath the festival’s signature white tents the region’s top burger maestros have been carefully selected to bring their best burger recipes and unique side dishes to the Atlantic City Food and Wine festival to compete for people’s hearts and stomachs. Each offering will be perfectly accented by refreshing Beer Garden and wine samples, grab a napkin, foodies, and dig in! Clam Bake: Calling all seafood living foodies for this adventure! The Atlantic City Food and Wine festival is bringing the epitome of this New England tradition to the Jersey Shore with a full-blown Clam Bake. Bally’s Beach will be transformed into a New England backyard with this summer’s Clam Bake, fully equipped with traditional menu items like lobsters, clams, corn-on-the-cob and an atmosphere that feels like home while your feet are in the sand. The Grand Market: Foodies, prepare your palate for perfection! The signature event of the Atlantic City Food and Wine Festival, The Grand Market will most certainly be the indulgence highlight of your year. Eat and drink your way through this eclectic tasting village. Featuring a wide selection of foods, wines, craft brews and liquors from world-renowned culinary masters, you will experience a true flavor adventure during your three-hour gourmet journey. And when you find something you love, take it home with you! Purchase your favorite flavors while culinary demos by celebrity chefs provide you with tips to enhance your home dining experiences. Blues Brews & BBQ: Throw on your boots, food-lovers … this festival is taking a tasty trip to the south! Kick your feet up as BBQ vendors take over and cook up some the best ribs, chicken and brisket you’ve ever tasted. And let’s not forget about the ice-cold beer! While you’re here, you can purchase some of the latest BBQ merchandise around. Tickets for the Atlantic City Food and Wine Festival can be purchased online at http://www.caesars.com/content/microsites/acfoodandwine.html, http://www.ticketmaster.com or by calling Ticketmaster at 800-736-1420. Congrats on taking part! Sounds like a fabulous event! Sorry it’s a little too far away for this year. Hopefully I’ll get a chance to meet you at the festival this year! I’ll be participating in the Grand Market Tastings as well as the Burger Bash with the Beef Checkoff program!